Thanksgiving marks the beginning of the holiday season. While many of you will be out shopping this weekend I hope some of you will find time to play in your studio. Why not collect your paper scraps and color coordinate them to create a set of note cards? What a lovely gift to create a stationery or thank you card set for a friend or loved one. 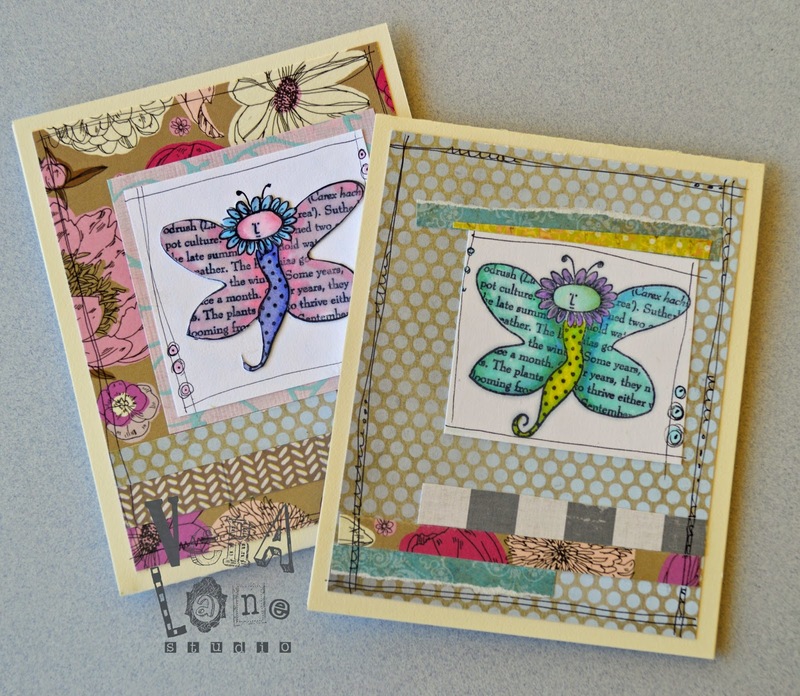 Large Fluerfly is stamped with Mementos ink and colored with markers. Scrap paper and Pitt pen are added for these fast and easy cards. Begin with folding a set of cards or use pre-folded ones. 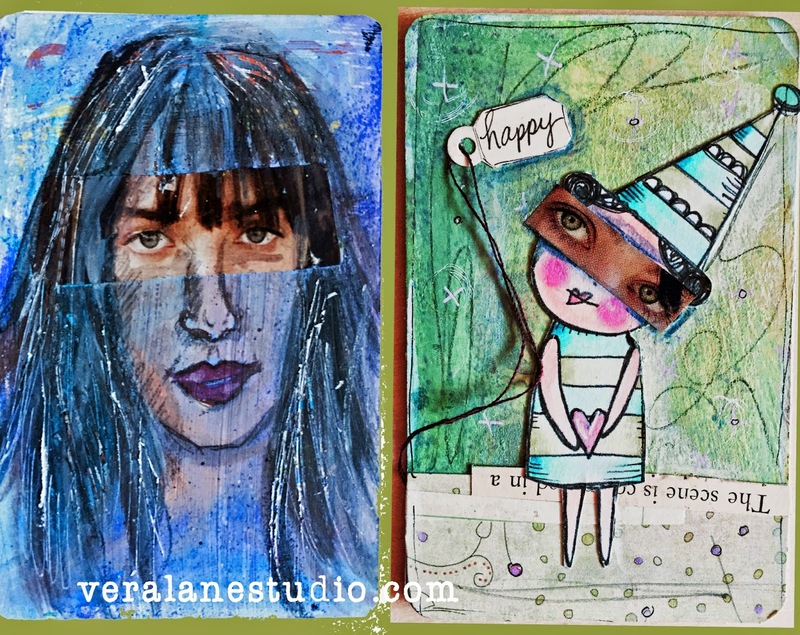 Consider recycling card fronts to collage over (the card on the left is from a 'thank you' card). Select your stamp of choice and cut squares of white to accommodate the image. Stamp ten to a dozen squares. Color with markers or your favorite media in a variety of color combinations. Select scrap papers to enhance the colored image and collage. Add Pitt pen doodles and a simple lined border. Stack the set with envelopes and tie with a ribbon. Insert the set of handmade cards in a cellophane sleeve. Presto! You have a gift without waiting in lines! Happy Thursday. Corrie is setting the challenge at the Stampotique Designers' Challenge Blog and she'd like everyone to make something with a stripy background. "You can use ink, paint or pens whatever you like, just no ready made stripes with pattern paper." My solution was to sew stripes of rickrack and have my bouncy little taxi cab right along the bumps. I left town after week 5 and it's been a trick to get back on track since my return. Here are my catch-up cards! 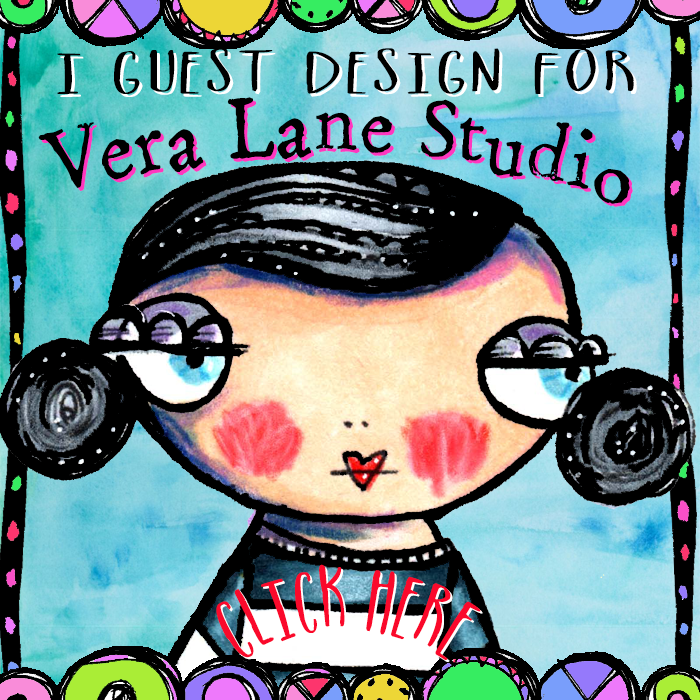 Left: I used "Wishbone" from my Vera Lane Studio digi stamp set. She's colored with Copic markers. 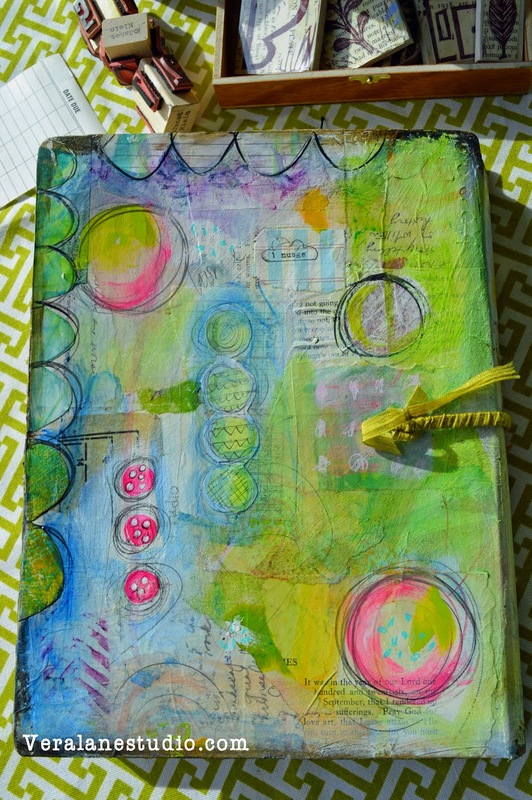 The background is a combination of Inktense and Neocolor wax pastels dripped and blotted. Right: A printed piece of cellophane (from fresh flowers wrap) is glued over Inktense color on prepared gesso. I used a portion of my crow line rubber stamp from Stampotique printed with Stazon ink. Week 7: Nautical/ Ocean theme. Not. 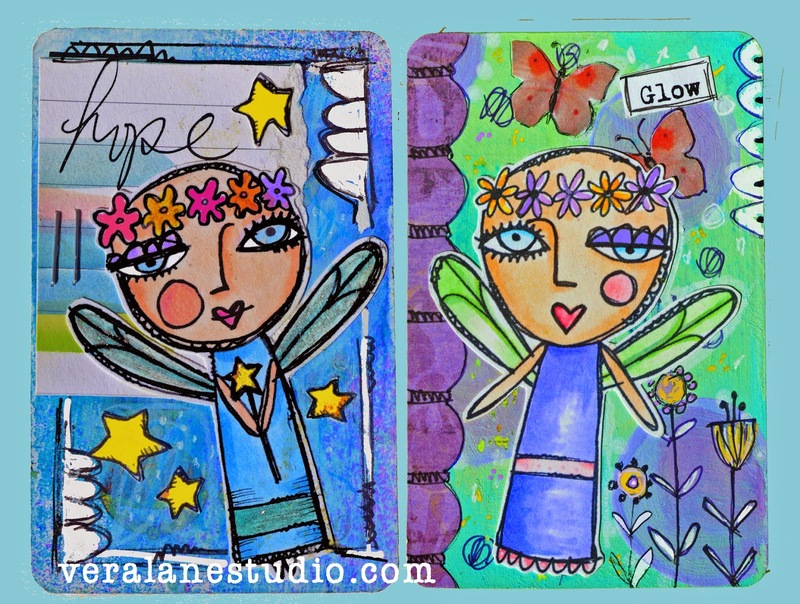 I substituted a fairy theme from my digi image set Firefly Fairies. They are colored with Copics with acrylic paint backgrounds. Pitt pen and paint pens add doodles. Left: Inktense blocks and Prismacolor pencils make up the background. I doodled with a fine Pitt pen for the border. Collage scrap and a charm complete the card. Right: Inktense wiped with babywipes and Sharpie paint pen make up the background. The scallop border is cut from printed deli paper. The stamp is my "love you heart" available from Stampotique. It's stamped with Stazon and clear embossed. 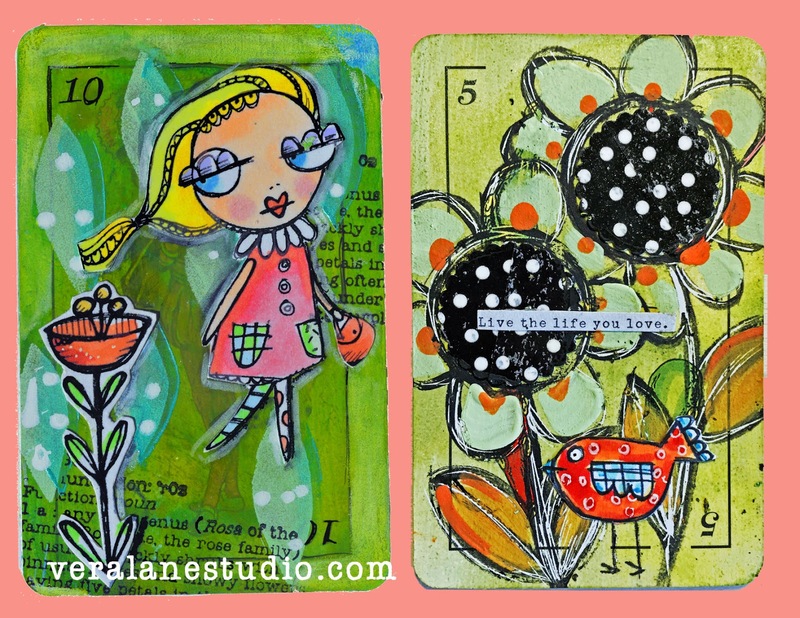 Left: Claudine used a stencil and text on one of her cards. I cut a stencil with scrap paper for the background. I used Gelatos and white paint pen in the stencil over an Inktense base. The character is "Blossom" from one of my digi stamp sets. Text stamp is the definition for "rose" -- also by Stampotique. Right: Claudine demonstrated how to align washi tape on paper to allow a punched circle. I followed that technique for the inside of the doodled flowers. I scraped the black line with the tip of an X-acto blade for a scratchy texture. The bird is from "Bud and Birds." I painted the flowers with acrylic paint and the bird is colored with Copic marker. Left: The background is Gesso with Inktense layered with Caran d' Ache neocolor II wax pastels layered and wiped with a baby wipe. I glued eyes from a magazine cutout and drew around it with Derwent watercolor pencils and a waterbrush. I used a mechanical pencils for shading and an X-acto knife to scratch into the hair. 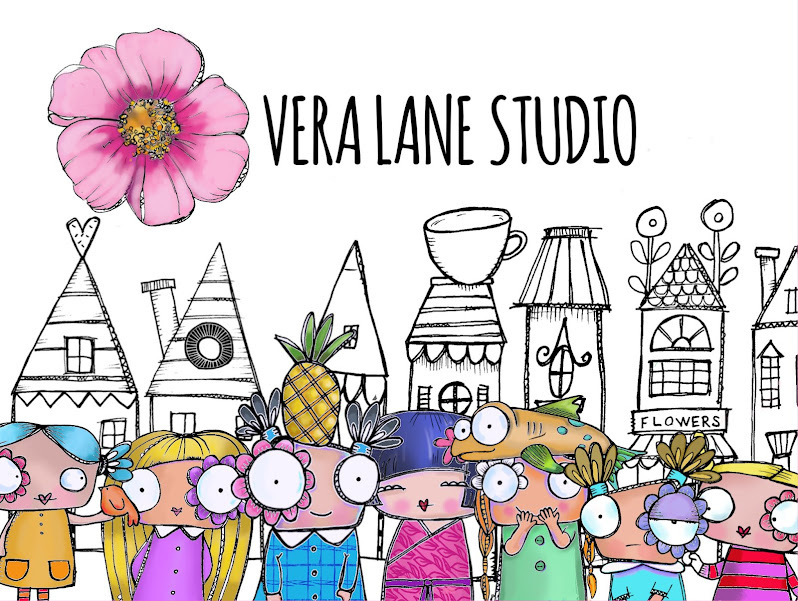 Right: The image is from Vera Lane Studio digi images colored with Copics. Eyes from a magazine cutout are glued in place with a tiny tag and scraps. Scribble with pencil and paint pens in a Distress stained background. I'm starting my New Year's resolution early. In 2015 I'm going to try to take a little more time for my own art. I share my studio with several young art students during the week. My art form has always been assisting children in their creativity. That in itself feeds the creative soul. In 2015 I intend to carve out a "me" day. Let's see how that goes. I have completed the cover of my 2015 Documented Life Journal after looking at the Cover Story Workshop at Art to the Fifth. I looked at Roben-Marie Smith's videos and a portion of Rae Missigman's. What I saw was so motivating that I will savor the rest of the series for inspiration later. My cover is mostly inspired by Roben-Marie's example. I collaged old letters, ledgers, patterns, and scrap paper. I added acrylic (Martha Stewart multi-surface satin) , gesso, and layers of Inktense wiped with baby wipes. My date was stamped with Random Acts, an alpha-stamp set I designed for Stampotique. I originally had the date on ledger paper exposed under an envelope window. After a late night I noticed I transposed my numbers and had to come up with another plan. An image floating in the bottom right corner was also not working for me. 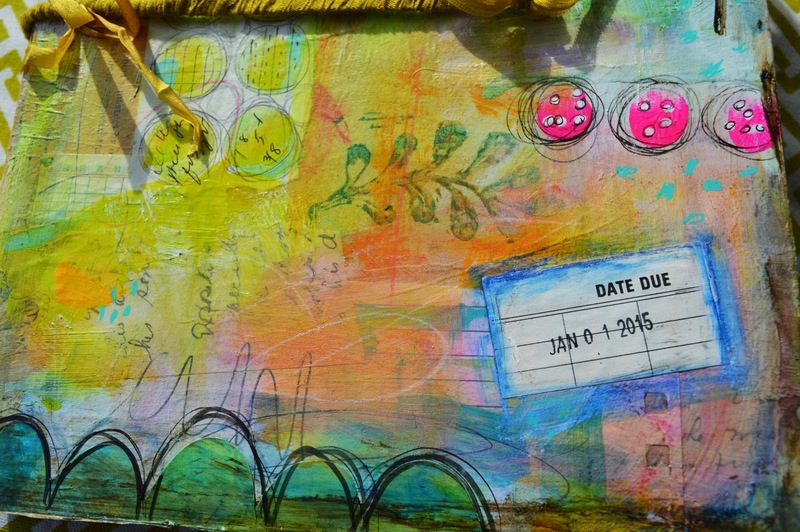 My solution was to add the due date with a date stamp to commence the beginning of DLP 2015 . The back cover is much of the same. I used a liner brush with black acrylic paint for my line work. The inside cover was screaming for some coverage. The base of the collage is Rae's technique. 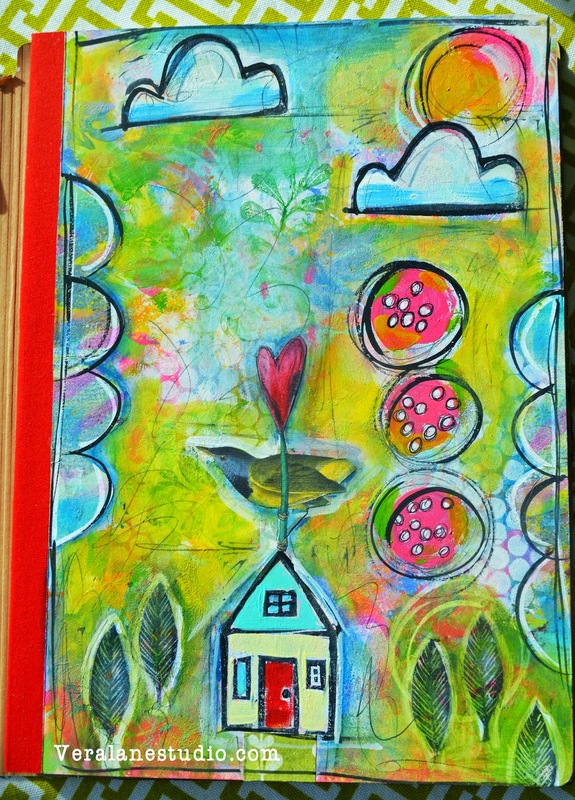 I layered over it with sequin waste stenciling, and more layers in Inktense. I really like the transparent layers that are created by wiping it down with baby wipes. It seems to add depth. A small cigar box of hand carved stamps from a day working with kids were begging to be used. 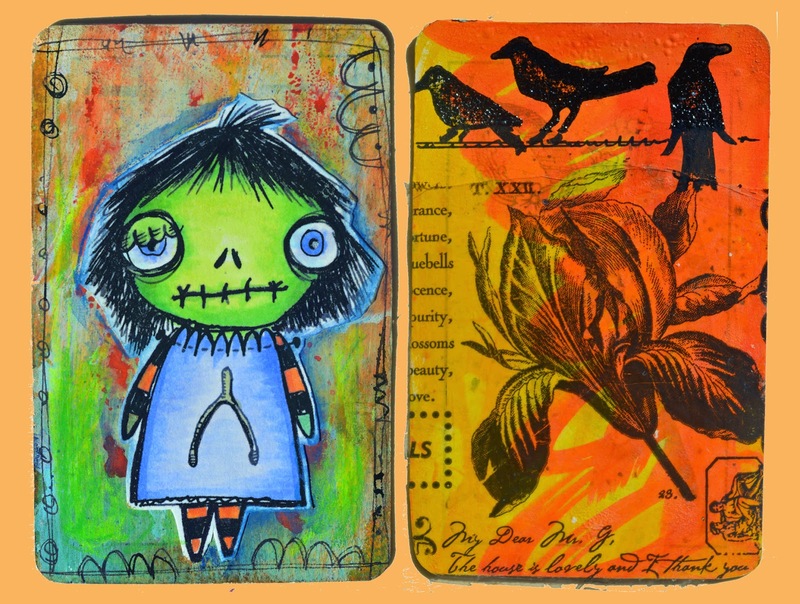 They were applied with Momento ink and Inktense blocks. Sharpie paint pens and graphite pencil scribbles are added throughout. My scallops are cut from Gelli prints on deli paper. Deli paper is such a perfect weight to collage with. Roben-Marie and Rae had so much more to their techniques, so I encourage you to take advantage of the workshop. You can borrow some great ideas and incorporate your own. 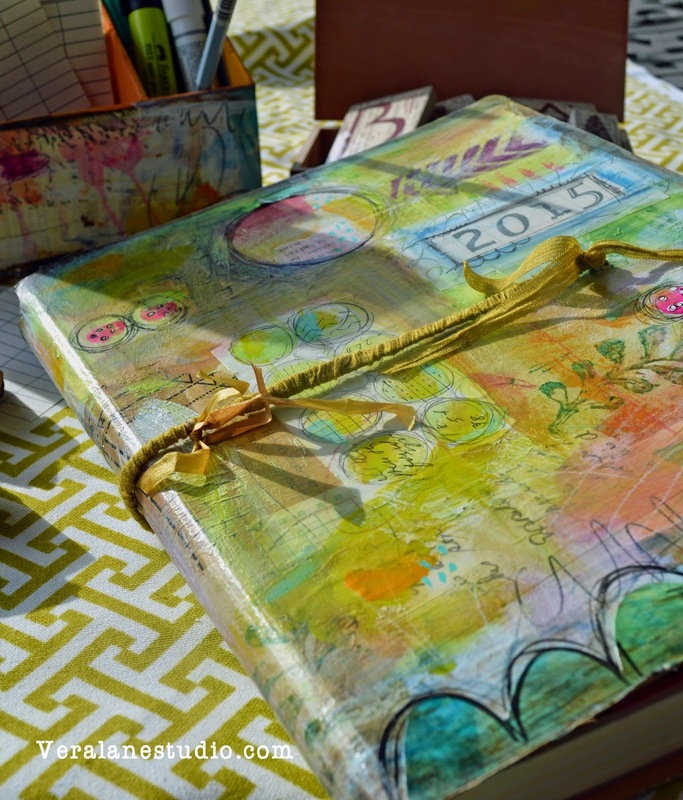 France Papillon is bringing on the bling at the Stampotique Design Team Challenge . In this sample I used sequin waste with blue and black paint layers for my sky. White paint is applied to create a scalloped border. The glowing moon (made with one of Daniel's circle stamps) is stamped and cut on painted paper with an added layer of orange glitter glue. France's star cluster is part of her design cube. I stamped it with clear embossing ink and heat set with clear embossing enamel. The stars get further bling treatment with Diamond Stickles. Agatha's moon is stamped and colored with Copic markers. I punched the cheek in the moon to expose paper underneath. The image is cut and mounted with glue dots. A zigzag stictch is used to attach the composition to a black cardstock. I used gold rhinestones to bling up the sky and complement the blue background. Arwen has been hostess this week at the Stampotique Designer's Challenge. SDC172 calls for the "Spotligting" technique. A portion of the stamped image stands out from the rest of it. I had another sample to post this morning but I wanted to give this a whirl as it was new to me. My studio was not my own today, as I had a few young students in and out. I didn't put a lot of thought into this and quickly I dug out my chipboard shapes. My "spotlight" would be a heart. 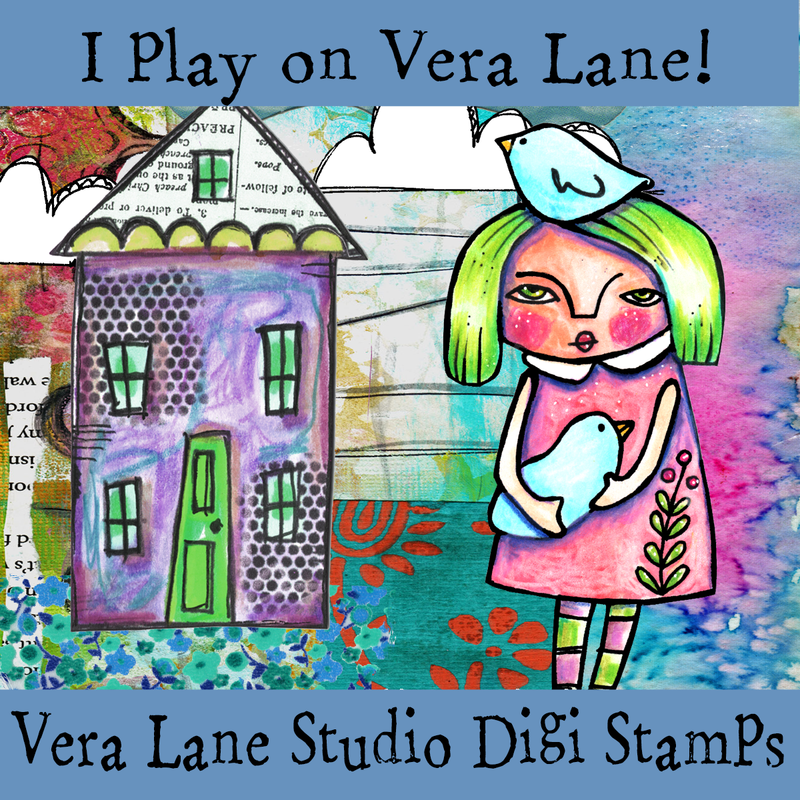 I had a piece of paper that was layered from excess Gelli Plate printing with soft pastel tones. I can't tell you why this snow family stamp came to me for this background -- perhaps the colors seems cool and icy to me. I stamped the snow family three times; directly on the painted background and on cardstock twice. I fussy cut the family and glued in place. I held the stamped snow family image up to a lamp and positioned the heart chipboard behind it to capture my spotlight image. This portion was colored with Copics. 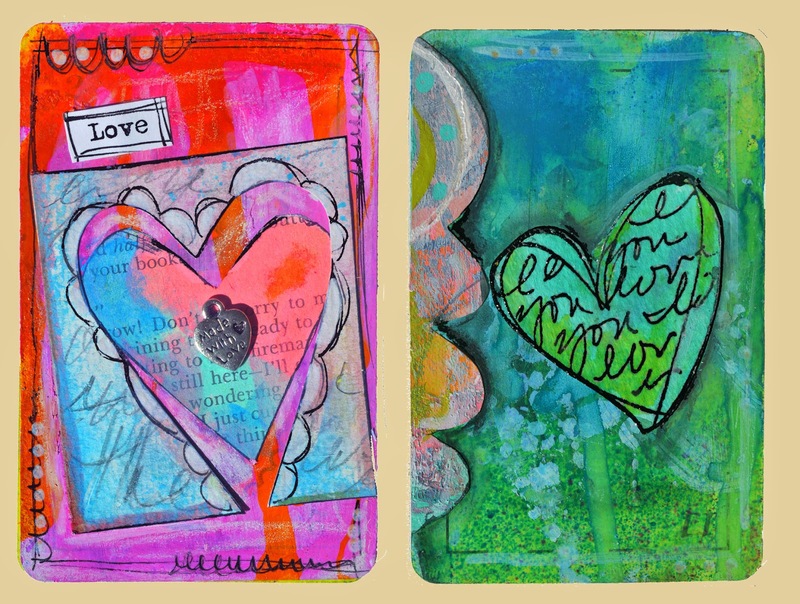 I thought about leaving the rest of the heart white, but added color in the background to merge with the painted paper. The green angle of the paint appeared to be highlighting the faces. The heart image was clear embossed. I took a thick black Sharpie to blacken the edge of the chipboard. The chipboard heart was glued in place. Contrasting paper was added to create a mat. A shredded piece of cotton is tied embellishment to complete the card.